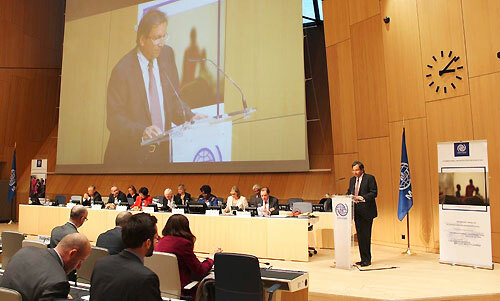 In his message, President Sirisena noted that Sri Lanka is recognized as the only country to have a dedicated, multi-sectoral and all-inclusive National Migration Health Policy and National Action Framework, with the objective of addressing the multi-faceted health challenges that emerge during all stages of migration across various migrant groups. He recalled that as the Minister of Health, he had the opportunity to meet the Ambassador William Lacy Swing, the Director General of IOM in September 2011 in Geneva and that the meeting indeed strengthened the partnership between IOM and Sri Lanka. The President said the IOM is a strong strategic partner globally and nationally in addressing problems related to migration, and that the people of Sri Lanka and he greatly value the various ways in which the IOM Mission in Sri Lanka has assisted the country in managing migration related issues around disasters and conflicts, as well as the present post-conflict rapid development. Earlier opening the panel discussion, Director General Ambassador Swing had referred to the meeting he had with President Sirisena in 2011 and the fruitful discussion they had during the meeting, particularly aimed at advancing the health of Migrants. He also thanked President Sirisena for being strongly supporting the IOM's initiatives related to health in Sri Lanka during his tenure as the Minister of Health.